Apparently they were big fans of "Green Acres". In a Low Energy World, no energy is lower than The National's. Yes, much more up-tempo, and it has actual "singing" on it. Nice to know they can deviate from their usual schtick. Agreed. This is more evidence that they can do it if they try. I'm hearing "I can't explain it, Eddie Albert!" Not a big fan of the National but I really like this...a bit reminiscent of Tull. Agreed.... we should have some El Vy on RP. Nominations (along with Return to the Moon): I'm the Man to Be, Silent Ivy Motel, Hapiness Missouri, and Sleepin' Light. Agreed. Good clip. Thanks KurtfromLaQuinta. Matt Berninger (lead singer of The National). Brent Knopf (founding member of Ramona Falls and Menomena), Andy Stack (of Wye Oak) and Matt Sheehy (of Lost Lander). I submitted it a while back... it was rejected immediately. I love the quirky lyrics and the music of this song! A The National song that does not sound like all the other The National songs. A new National! Yesssss! I'm Happy. I can't listen to these political drones anymore. They put me in a bad mood. The drummer is still in love with his snare drum. I agree, it does sound a bit like something like a today's version of Republic Tigers, but the keyboards, often overshadowed, are awesome; Charlatans UK and Pink Floyd come to mind...and the guitar is really pretty rippin' and I gotta say I love it. They're growing! Almost...the drummer still has this thing with the snare drum. I just... haunting. 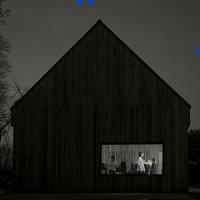 I love The National, but this raises the bar. Thanks, Bill. Wouldn't have noticed it without your curation. I can't see why this band bothers with making new releases..... just repackage the old ones, no one will be able to tell the difference. new guitarist? or did they just loosen his leash a little? whichever, I like the change. I think I like the underlying message of this track, like a lot of The National, good lyrics good song, but for me I'm not a huge fan of the vocals or instrumentation. I'm somewhere between "MEH" and "AWESOME" - call it a 7 for now.